You can’t resist this St. Patricks Day Project! As I considered truly Irish symbols to inspire a St. Patrick’s Day craft, the Irish flag came to mind. The struggle between the Irish (green) and English (orange) with the white in the middle representing peace…the resistance of one to the other conjured a profound need to represent it artistically… Or maybe not. I actually was thinking about creating a fun treasure map or a “hidden” pot of gold but lemon juice and open flames were just not a solid choice. In thinking about the flag and its meaning while project hunting did make me realize that the history of the flag did seem to fit. Don’t cha think? So artistic resist it is! When I sat down to try some fun things with the kiddos, what I got was, well, a lot of resistance. It was one of those “We are going to have fun RIGHT NOW” … resistance is futile! moments and you all know how well those go over. So, I let it go and soldiered on to figure out what fun things I could figure out. One of the quickest and easiest resist techniques to do with kiddos is with crayons and water colors. You can draw anything you like with crayon and then use watercolor over it. The crayon resists taking on the color of the paint. So fun! First up was a glue stick. Did you know that glue sticks can go bad? Yup… They can. Sticky ewey never drying mess… Ask me how I know! Anyway, the glue stick did not quite resist as I expected, but again, was washable so even one layer made it degrade a bit. It wasn’t quite thick enough to resist crayon either. Next, liquid kid glue got a shot. The kid glue worked really well for both crayon and watercolor! Finally, mod podge/decoupage glue finishes were up. This glue is much thinner than kid glue so is easy to spread with a paint brush. It also worked really well with both crayon and water color. So then onto shape making… it is really fun to make stamps and masks out of different things around the house. The top heart shaped petal shamrock was made using a heart shaped sponge from a floral bouquet. Loaded it up with modpoge and three stamps later… shamrock! Next, I cut a shamrock out of an old cereal box. The piece punched out became a stamp, the piece with the hole left in it a mask. Loaded the stamp and wham… shamrock. Placed the mask down, dabbed glue into the cutout shape and cahow… shamrock. By now, I had the attention of a couple of kids so next we tried thumb print shamrocks. I LOVE finger and hand print art. I just think it is so personal and fun and captures moments in time so wonderfully, so was happy to see that method also worked well. Of course we had to let the paint dry on our fingers to peel off because that is so fun too! That is when the inevitable crafting accident happened. Although I had the smallest amount of water imaginable on the table, it sure enough spilled over onto the “trial” page. When my daughter dabbed it up, something fun happened! The paint came off the glued resist! I thought the first attempt was cool but was happy to see a second option emerge! The final project was a combination of all of the techniques. Using a peice of water color paper, I traced a shamrock decoration we had in the house with a crayon and did some doodling inside. I then covered it in glue. 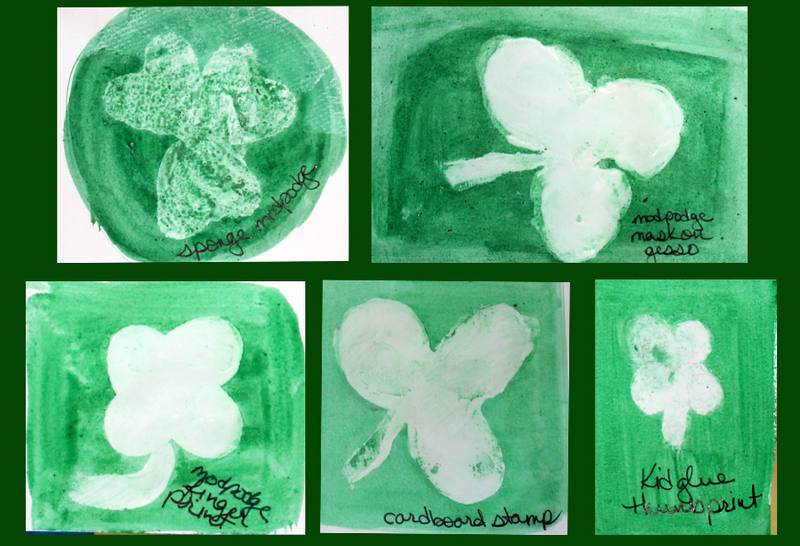 My children were cooperative and each helped me with thumbprint shamrocks. And finally, the word lucky was written in the corner. Tilting my paper upright, I washed watercolor over the paper edge to edge in order of the rainbow. By standing it upright and by using watercolor paper, the watercolors blended nicely into each other to accentuate the watercolor effect. Voila! Watercolor rainbow, St. Patrick’s Day inspired glue resist piece de resistance! Would love to hear what resists you try! Thanks for reading.